My Mojo Sock is in time out, so I started a new sock out of Opal Wildflowers. It’s not very interesting to look at yet, as it’s just a plain sock. Instead of showing you a picture of a plain sock foot, I’m going to tell you about my exciting mail. 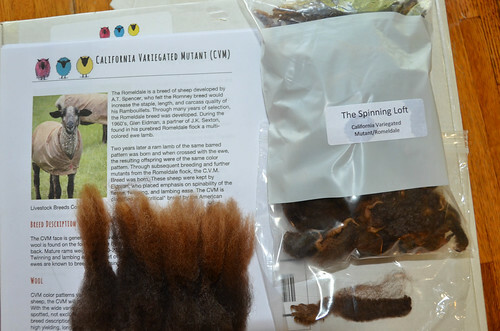 This week I received a box from The Spinning Loft. The Loft is known for their selection of raw fleeces. The variety that Allison stocks is impressive, even including a new shipment of British breeds, imported from their homelands. 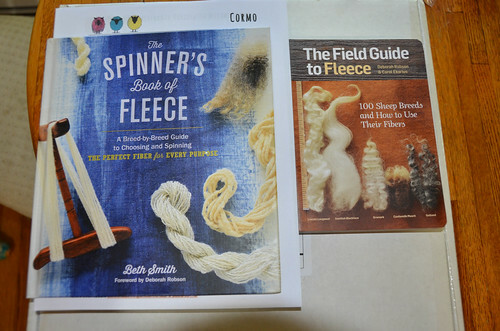 That’s Beth Smith’s new book on the left, and the Field Guide to Fleece by Carol Ekarius and Deborah Robson on the right. 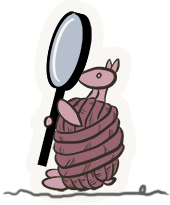 The Field Guide is a companion book to The Fleece and Fiber Sourcebook by Carol Ekarius and Deborah Robson. I wanted the book so that I would have a more concrete idea of what I could expect from a fleece when shopping at Rhinebeck or Maryland Sheep and Wool. Beth’s book is fabulous, just as I had hoped it would be. The writing is clear. The photos are clear. The book encourages the reader to go out and “Just Do It”, sample a fleece or 100. This weekend, with Beth’s words in mind, I decided to turn to those bags of fiber I mentioned earlier. I had ordered one of The Spinning Loft’s Fiber Samplers. And I’m not sorry I did. The sampler I ordered came with 2oz each of 12 breeds of wool. My sampler contained everything from Cormo to Teeswater to Clun Forest and a wide variety in between. Many of these are breeds I’d heard of, but couldn’t imagine being brave enough to spin. 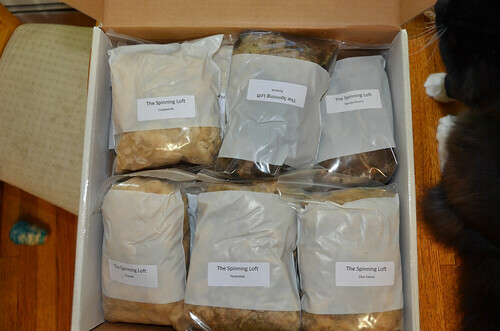 The box also contained entries for each breed of wool from The Spinning Loft’s “Sheep-o-Pedia”, a fantastic resource for learning a little bit about the fleece in each bag. And Tiny decided that ALL THE WOOL BELONG TO HIM!!! After booting the cat out of the box, I chose to start with a 2oz bag of CVM/Romeldale. The wool was fairly light in grease (VERY light compared to the Cormo I’ve been spinning), with good lock structure. I decided to do an experiment, and wash these lock by lock, in the manner of Margaret Stove. I took a video, so you can see me in all my wool washing glory. The video is at the bottom of this post. Spoilers: The concept worked extremely well, and I continued on to wash about half of the wool in this method. I lost about 20% weight to grease and um, poop. The wool didn’t loose its sheepy smell, but I suspect that may be because it was a boy. I had a significant number of locks that were shorter than the rest, but not so short that they couldn’t be spun. I lost some weight from the bag because I chose to discard anything that was obviously poopy, that I didn’t think I could save. The resulting locks are really lovely. I think I have enough to do 20 yards of woolen and 20 yards of worsted, although I’m loathe to hand card such perfect locks. I’ll update next weekend after I’ve had a chance to spin up what I’ve got. 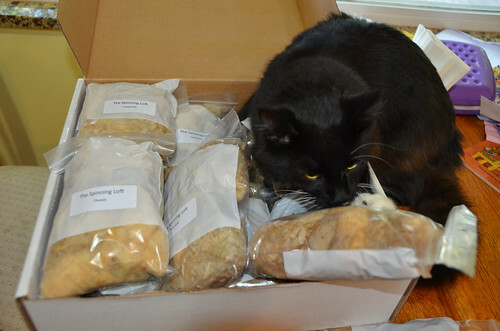 I’d love to know which of the sampler boxes you had – I can’t find any with 12 different breeds in! Alison picked out some really nice fleeces to try!